When most people think of the state of Michigan, they think of Detroit and Motown and the auto industry, hit so hard recently due to a troubled US and global economy. Yet, despite recent news stories about the decay and downfall of Detroit, there is more to Michigan than cars, blight, and tough times. The ancient Chinese hexagram for crisis means both danger and opportunity. The Michigan economy may be in a crisis now, being the hardest hit of all the states, but the Great Lakes state also has an incredible opportunity to be an environmental leader, paving the way to a greener economy for the entire country. Beautifully diverse and rich in natural resources, with a thriving agricultural industry and a tourist industry focused on outdoor recreation, the state of Michigan is poised to become an international leader in environmental stewardship and bioeconomics. As Michigan residents, we have an opportunity to be a part of this change and transition to a brighter and more economically viable future, and a more sustainable way of life. There is widespread commitment to enhance our conservation efforts and strategies to improve the management of our natural resources throughout the Great Lakes. There are programs underway to implement cleaner, renewable energy solutions and to increase public awareness of green issues. A grassroots movement to reclaim and green up the city of Detroit through the creation of urban gardens is taking root, and Michigan’s involvement in the organic industry also has the potential to play a significant role in the state’s developing bioeconomy. There is a lot of work to be done, but with increased awareness and involvement, the future of Michigan is bright green with promise. Inside this section you will find more information about the initiatives and programs that are underway to create a greener future for Michigan, as well as a variety of resources and ways to get involved on a local level for those of us residing here. Visit our Green Michigan page and check out our list of programs, groups, and events involved in work to green up Michigan and increase public awareness of green issues. Find out about Michigan alternative energy and the role renewable energy sources will play in the future of Michigan's economy. Learn more here. Support our local Michigan organic farmers! Learn all about the Michigan organic movement here. 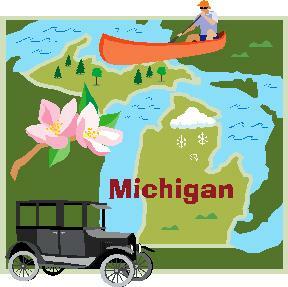 Click here to return from State of Michigan to Green-Organic-World.com's Home Page.